You may have learned about SMART goals in middle school. Here’s a quick review to help you remember the five rules for setting goals as you work your way through this book and set your own goals. National physical activity guidelines for youth developed by the U.S. Department of Health and Human Services (USDHHS) recommend at least 60 minutes of physical activity each day. To truly understand energy balance, we have to start by understanding energy expenditure or output. Your body’s natural way of maintaining balance is to replenish the calories it uses. This innovative new textbook, with a full suite of related resources, has been created to support student development and enhancement of healthy behaviors that influence their lifestyle choices and health and fitness. A key feature of this curriculum is the complete integration of physical education and health concepts and skills to maximize student interest, learning, and application. This objective was accomplished by combining the expertise of our author teams from two related textbooks--Fitness for Life, Sixth Edition, and Health for Life. This is not just a health textbook with a few physical education concepts thrown in. School systems that want a single textbook to help them address national, state, and local standards for both physical education and health education will find that this book provides them a unique and cost-effective option. Part I, Fitness for Life, will help students become physically literate individuals who have the knowledge, skills, and confidence to enjoy a lifetime of healthful physical activity. The book will guide students in becoming informed consumers on matters related to lifelong physical activity and fitness, taking responsibility for setting individualized goals, and making their own plans for active living. To accomplish this overarching goal, they learn a variety of self-management skills, including self-assessment. The program is based on established educational theory, which is outlined in the teacher web resources. Part II, Health for Life, teaches high school students the fundamentals of health and wellness, how to avoid destructive habits, and how to choose to live healthy lives. This text covers all aspects of healthy living throughout the life span, including preventing disease and seeking care; embracing the healthy lifestyles choices of nutrition and stress management; avoiding destructive habits; building relationships; and creating healthy and safe communities. Health Opportunities Through Physical Education is available in print and digital formats, including an interactive iBook version for iPads plus other e-book formats that students can use across a variety of platforms. It also features a wide array of web-based student and teacher resources that are accessible from the dedicated web site at www.HOPEtextbook.org. 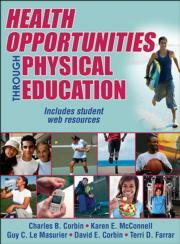 High school textbook for courses that combine physical education (personal fitness education) and health education. Dr. Charles B. (“Chuck”) Corbin, PhD is Professor Emeritus in the School of Nutrition and Health Promotion at Arizona State University. He co-authored two successful health series for use in grades K-8, and is senior author of several award winning elementary, middle school, high school, and college texts including Fitness for Life: Elementary School, Fitness for Life: Middle School, Fitness for Life (6th ed. ), all winners of Texty Awards (Text and Academic Authors Association-TAA), and Concepts of Physical Fitness (17th ed.) winner of the McGuffey Award (TAA). His books are the most widely adopted public school and college texts in the area of fitness, health, and wellness. Dr. Corbin is internationally recognized as an expert in physical activity, health, and wellness promotion, and youth physical fitness. He has presented keynote addresses at more than 40 state AHPERD Conventions, made major addresses in more than 15 different countries, and has presented numerous named lectures. Among his many honors are the Alliance Scholar and Gulick Awards (Society of Health and Physical Education Professionals, formerly AAHPERD), Cureton Lecturer (ACSM), Healthy American Fitness Leaders Award from the President’s Council on Fitness, Sports, and Nutrition (PCFSN), and National Jaycees. He is also a member of the NASPE Hall of Fame and a recipient of the Heterington Award (National Academy of Kinesiology). Dr. Corbin served for more than 20 years as a member of the Advisory Board of Fitnessgram and was the first chair of the Science Board of the President’s Council (PCFSN). Karen E. McConnell, PhD, a Professor at Pacific Lutheran University, is a Certified Health Education Specialist (CHES) and has taught at the university level of more than 15 years in areas related to health and fitness education, curriculum and assessment, and exercise science. She has written or contributed to over a dozen book chapters and texts including the teacher’s resources for Fitness for Life (5th and 6th Ed). She is a past recipient of the Arthur Broten Young Scholar award and has received the University Professional of the Year award from the Washington Alliance for Health, Physical Education, Recreation and Dance for contributions made to state standards in health and fitness. . She enjoys running, having completed 38 half marathons and one marathon As a resident of the Pacific Northwest she enjoys participating in most outdoor activities. Guy C. Le Masurier, PhD, is a professor of physical education at Vancouver Island University, British Columbia, Canada. He has published numerous articles related to youth physical activity and physical education and coauthored the National Association for Sport and Physical Education (NASPE) Physical Activity Guidelines for Children. Dr. Le Masurier has given more than 30 research and professional presentations at national and regional meetings. He reviews research for numerous professional journals and has contributed to Fitness for Life, Fifth Edition, and the Physical Best Activity Guide. Dr. Le Masurier is a member of AAHPERD, NASPE, ACSM, and Canadian AHPERD. David E. Corbin, PhD, taught health education at the high school level for many years before beginning a career in health education at the college level. He is emeritus professor of health education and public health at the University of Nebraska Omaha, where he taught for over 30 years. He has authored, coauthored, or edited four other health-related books, and is a fellow and lifetime member of the American School Health Association. Corbin received the Mohan Singh Award for humor in health education and health communication from the American Public Health Association. He was also named the Nebraska Health Professional of the Year by the Nebraska Association for Health, Physical Education, Recreation and Dance, and he received an Excellence in Teaching award from the University of Nebraska Omaha. Corbin has also appeared on Late Night with David Letterman. In his leisure time, he enjoys cycling, walking, traveling, and singing and playing the guitar. Terri D. Farrar, PhD, is a visiting assistant professor and director of the Bachelor of Arts in Kinesiology Program at Pacific Lutheran University in Tacoma, Washington. She has taught health and fitness at the high school level for 20 years, and teaches health and fitness pedagogy at Pacific Lutheran. She is a member of SHAPE America—Society of Health and Physical Educators (formerly AAHPERD) and of the Washington chapter of SHAPE America. She is also a member of the American Association for Health Education, the Association of Applied Sport Psychology, and the Alliance of Women Coaches. She enjoys traveling, working out, and coaching fastpitch softball. All ancillary materials for this text are FREE to course adopters and available online at www.HumanKinetics.com/HealthOpportunitiesThroughPhysicalEducation1E. Health Opportunities Through Physical Education is available in print and digital formats, including an interactive iBook version for iPads plus other e-book formats that students can use across a variety of platforms.